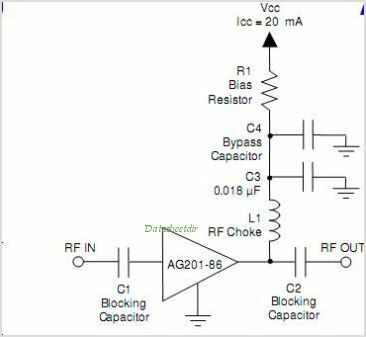 The AG201-86 is a general-purpose Buffer Amplifier that offers high dynamic range in a low-cost surface-mount package. At 900 MHz, the AG201-86 typically provides 11 dB gain, +19.5 dBm OIP3, and +6.5 dBm P1dB. The device combines dependable performance with consistent quality to maintain MTTF values exceeding 1000 years at mounting temperatures of +85 and is housed in a lead- free/green/RoHS-compliant SOT-86 (micro-X) industry- standard SMT package. By WJ Communications, Inc. This is one package pinout of AG201-86,If you need more pinouts please download AG201-86's pdf datasheet. 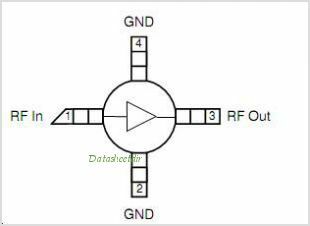 This is one application circuit of AG201-86,If you need more circuits,please download AG201-86's pdf datasheet.